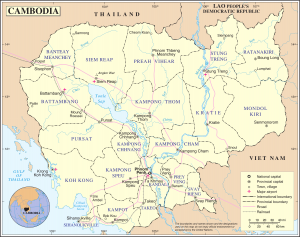 Cambodia is a country in South East Asia, approximately three quarters of the size of the UK and with a population of 15 million. It is bordered by Thailand on the west, Laos to the North and Vietnam to the East. It is predominantly a Buddhist country. Cambodia has come through tremendous turmoil, starting in the 1970s with the atrocities of the Khmer Rouge regime and the legacy this regime left behind. Cambodia is a particularly poor country with a significant unemployment rate. The major economic challenge for Cambodia over the next decade will be fashioning an economic environment in which the private sector can create enough jobs to handle Cambodia’s demographic imbalance. More than 50% of the population is less than 25 years old – compared to around 25% in UK – and these young adults will need a means of earning in order to support themselves. The population lacks education and productive skills, particularly in the poverty-ridden countryside, which suffers from an almost total lack of basic infrastructure. It must be noted that the major cities; Phnom Penh and to a lesser extent also Siem Reap, Battambang and Sihanoukville have seen rapid development in the past 5 years. High rise buildings, shopping malls and modern coffee shops have sprung up in these developed areas. However this development is sadly lacking in the many locations we work throughout rural Cambodia. Often homes do not have electricity or adequate sanitation facilities. Schools are under-equipped, over-subscribed and often in a state of disrepair.